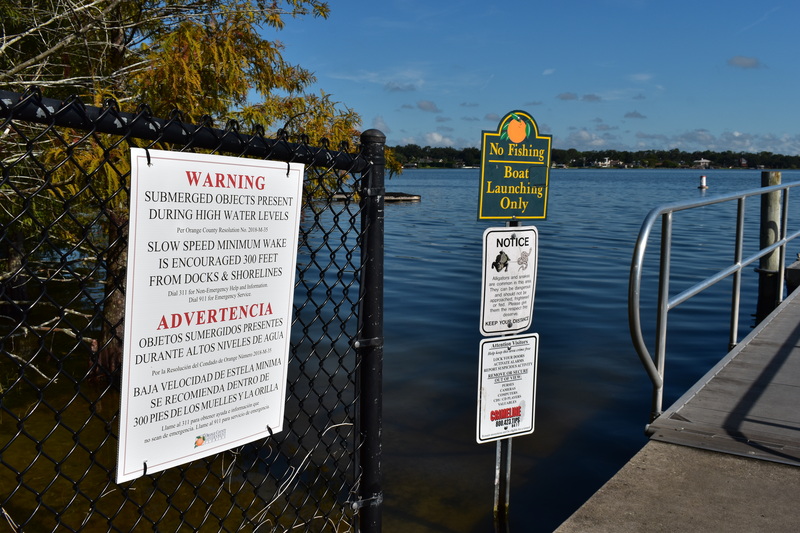 The Orange County Board of County Commissioners passed a resolution on Sept. 18, 2018 urging operators of all watercraft vessels to slow down in areas 300 feet or less from docks, piers and shorelines. The resolution also encourages property owners to mark submerged docks because of the potential navigational hazards of high water levels. Due to the unusually high amounts of rainfall that have occurred over the past several months, Orange County is issuing an advisory that current water levels on various lakes are high. Boat docks may become hidden just beneath the surface being a danger to boaters, skiers and wakeboarders. Please avoid these submerged structures that are normally visible during normal water level periods. All watercraft should remain at least 300 feet from the shoreline whenever possible or travel in the center of the lake when approaching vulnerable shorelines. Maintain a slow speed and minimum wake when travelling within 300 feet of the shoreline. Residents are encouraged to contact 3-1-1 or visit www.ocfl.net/311 for non-emergency help and information regarding high water levels. Photo Caption: Randolph Boat Ramp located on Little Lake Conway in Orlando.